Welcome to another installment of Reissue Theory, where we reflect on great albums and the reissues they could someday see. At the time of his untimely death in 1973, Bobby Darin was signed to Motown Records, where he recorded one solo LP and enough material for a posthumous second LP. Despite their high quality, Darin’s Motown recordings have long been unavailable. Today’s Reissue Theory takes us back to 1970 and the final chapter in the life of the great Bobby Darin. Bobby Darin was so much more than just “Mack the Knife.” Stricken with rheumatic fever as a child and left fighting a heart condition throughout his 37 years, Darin never stopped reinventing himself in a race against the clock. After struggling at Decca, the man born Walden Robert Cassotto made his first splash at Atco – “Splish, Splash” actually – as a young, brash rock-and-roller, while operating behind-the-scenes as a deft songwriter, shrewd producer and keen businessman. Sensing that this rock-and-roll thing might just be a flash in the pan, he dared to take on the territory of Frank Sinatra with a successful series of adult pop albums and of course, “Mack the Knife” just a year after “Splish Splash.” As longtime friend Dion DiMucci said, “[Even in his youth] Darin had more on his wish list than being a teen idol.” When Sinatra exited Capitol to form the Reprise label in 1962, Capitol even lured Darin from Atco, symbolically replacing the Voice himself. While it’s unknown if Sinatra really said that Darin was fit to play his prom dates, he undoubtedly took notice of this young, talented upstart. As the 1960s rolled onward, Darin felt compelled to embrace his youth. While already Hollywood royalty (with a high-profile marriage to Sandra Dee and an Academy Award nomination for 1963’s Captain Newman, M.D. ), he could no longer ignore the tumult around him. Devastated by the assassination of his friend Robert F. Kennedy, the singer traded his tuxedo for denim and became “Bob Darin,” content to gently strum folk and protest songs, including his own powerful “A Simple Song of Freedom.” Yet when 1970 arrived, this restless musical wanderer found the inner strength to embrace his many facets. Just weeks after taking out ads denouncing the U.S. invasion of Cambodia, and speaking publicly at anti-war demonstrations, Darin returned to his one-time stomping ground of Las Vegas, reinstated the brassy “Mack” to his set, and co-hosted The Mike Douglas Show. The final stage of what would be Darin’s last reinvention was signed, sealed and delivered with the singer’s contract to Motown Records. Motown was in the midst of great changes itself, relocating to Los Angeles and establishing a broad roster of artists over many genres. (Another great all-around entertainer, Sammy Davis, Jr. , released his first Motown single roughly a month before Darin’s.) Darin remained with Motown between 1970 and his death in 1973, and yet his catalogue for the label is curiously absent from CD. Collector’s Choice comprehensively reissued much of Darin’s Atco career, a variety of labels have taken on his Capitol output, and Edsel mined both his post-Capitol return to Atlantic and the work on his own label, Direction. But Darin’s eponymous Motown studio debut remains unreleased on CD, a posthumous studio album is long-deleted and only Live at the Desert Inn (itself shelved for 17 years) remains in print. 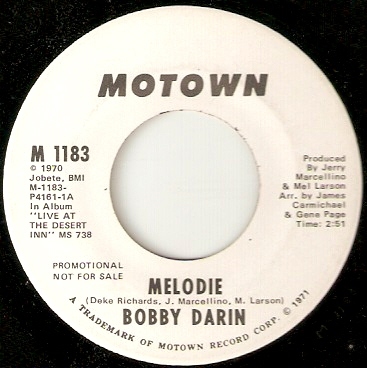 So let’s raise the curtain and hit the jump for today’s Reissue Theory, looking at Bobby Darin (1972) and Darin 1936-1973 (1974), or The Motown Years. 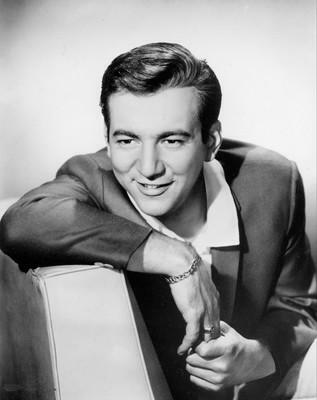 Upon Bobby Darin’s signing with Motown, he had been away from the recording studio for nearly two years. His last LP, Commitment, was released on his own Direction label in July 1969 and was a collection of entirely self-written material. While the album did not chart, it received a number of plaudits including one from Cashbox. The magazine proclaimed that Darin’s self-penned anthems were “shattering songs of social consciousness that belong in the mainstream of our new American revolution.” Darin clearly took such words to heart, introducing the new material into his Las Vegas sets, rechristening himself “Bob Darin” (only three letters away from a certain other Bob from whom Darin had clearly taken a page or two) and refusing requests for “Mack the Knife” from his audiences. Whatever the artistic merits of his Direction LPs, Darin had a lifelong hunger for success that led him to Motown. When Darin entered Motown’s Hollywood studios, it was hoped that “The Sound of Young America” would reinvigorate the star, known for his bravado, vivacity and determination. His first release for the label was Motown single 1183, “Melodie” b/w a revival of Diana Ross and The Supremes’ valedictory “Someday We’ll Be Together.” It was released in April 1971 in the wake of Darin’s January surgery to address his heart problem. The label had recorded Darin at Las Vegas’ Desert Inn for release, but shelved the LP and it didn’t see the light of day until 1987. Motown mainstay Deke Richards hooked up Darin with newbie producers/songwriters Jerry Marcellino and Mel Larson. Marcellino remembered in the liner notes to The Complete Motown Singles Volume 11A that Bobby “wanted to be an R&B singer. That’s what he liked. When he went to Motown, he was trying to sing stuff like The Four Tops. So we wrote that song [‘Melodie’] for him, a Four Tops kind of song.” For the B-side, the producers turned to a newly-minted standard. “Someday We’ll Be Together” was written back in 1961 and recorded on the small Tri-Phi label by Johnny (Bristol) and Jackey (Beavers), two of its authors. But after Diana Ross turned it into a hit, “Someday” had been covered in-house by Earl Van Dyke, Gordon Staples and the Motown Strings and Wanda Rogers as the Marvelettes. The Ross-less Supremes returned the favor later in 1971 by covering Darin’s “Melodie” with, yes, The Four Tops, for their joint album Dynamite. Larson and Marcellino also recorded “Melodie” with Michael Jackson, though that version languished for years. While “Melodie” had an expected Motown feel (unlike Sammy Davis’ work for the company), “Someday” boasted a gospel-styled arrangement courtesy of Gene Page, who co-arranged “Melodie” with James Carmichael. While the single failed to chart, both sides showed Darin’s already-proven versatility. When Bobby Darin arrived in stores in August 1972, potential record buyers would be forgiven for wondering which Bobby Darin they were getting. Billboard assured readers on August 19 of that year that Darin sounded “better than ever” on the Joe Porter-produced LP “which will bring him back to the charts with impact.” Motown M 753L promisingly opened with Darin’s take on Randy Newman’s ironic masterpiece “Sail Away.” This marked a reunion of sorts between Newman and Darin, who co-wrote “Look at Me” for Darin’s 1964 album From Hello Dolly to Goodbye Charlie. Darin again brought a gospel influence to the fore, perfectly capturing Newman’s scathing satire. Using his tools developed as an actor, he persuasively drawled as a slave trader “pitching” potential slaves to “sail away” to America with him. (“You’ll be as happy as a monkey in a monkey tree…”) The LP had a markedly contemporary feel, with a version of Cat Stevens’ “Hard-Headed Woman” and Ben Peters’ “I’ve Already Stayed Too Long.” Darin teamed with his drummer Tommy Amato to write “Something in Her Love,” and turned to Scott English and Richard Kerr for “Who Turned the World Around.” (English and Kerr would earn substantially greater royalties a couple of years later when their “Brandy” was recorded by Barry Manilow as “Mandy” and shot to Number One!) George Clinton contributed “Average People” and Darin looked back for the chestnut “Let It Be Me.” Unfortunately, Billboard’s prediction didn’t come true, and Bobby Darin had negligible sales. Perhaps listeners weren’t ready for a “MOR” Darin with soul influences, having followed him through teen pop, big band and folk-rock phases. Bobby Darin has never been released on CD, and is therefore the centerpiece of our The Motown Years. He never sounded more comfortable, and Jimmie Haskell and Michael Omartian both provided strong arrangements. “Sail Away” b/w “Hard-Headed Woman” was released as Motown 1203, while “Average People” b/w “Something in Her Love” followed as Motown 1212. Darin was a visible presence throughout 1971-1972, appearing on Night Gallery, The Flip Wilson Show and Ironside, as well as playing high-profile concert engagements. None of that, however, helped Bobby Darin. Plans were made for Darin to join hitmaking producer Bob Crewe in the studio for a follow-up LP. One track from their sessions, a recording of Smokey Robinson and Michel Legrand’s theme “Happy” from Lady Sings the Blues, emerged as Motown 1217. Released in November 1972, it was Darin’s final single release for the company, with “Something In Her Love” again the B-side. The artist kept a busy profile on television as 1973 began, headlining The Bobby Darin Amusement Co. for NBC. He remarried in June, opened another Las Vegas engagement in July, and saw the release of what would be his final film, Happy Mother’s Day…Love, George, in August. (Also known as Run, Stranger, Run, the film featured Darin as part of a stellar ensemble including Cloris Leachman, Patricia Neal and Ron Howard.) The August 26, 1973 performance at the Las Vegas Hilton would turn out to be Darin’s final performance. On December 11, he entered Cedars of Lebanon Hospital in Los Angeles to repair two artificial heart valves received in a past operation. He died following surgery on December 20, aged just 37. Motown responded in February 1974 by issuing Darin 1936-1973, its tribute to the great entertainer. This 10-track compilation was a mixed bag, sonically. It contains three Crewe-produced tracks including “Happy,” as well as two songs from the abandoned Desert Inn set (“If I Were a Carpenter” and “Moritat,” a.k.a. “Mack the Knife” under its original title from The Threepenny Opera), four produced by Darin himself (including Bob Dylan’s “Don’t Think Twice, It’s Alright” and “The Letter,” popularized by The Box Tops) and one retread from the first LP which was perhaps its strongest track, “Sail Away.” Crewe did a fine job with all three of his productions. The sensitive reading of Paul Williams and Roger Nichols’ beautiful “I Won’t Last a Day Without You” was arranged by Charles Fox, a successful composer in his own right, and Darin’s vocal is light years’ removed from his customary swagger. He handles the resigned, wistful lyric with emotion and restraint. Another Darin/Amato original, “Another Song on My Mind,” benefited from Crewe’s clean production. Rumors have persisted that there is unreleased material recorded by Darin in the Motown vaults; this would come as no surprise to label connoisseurs. Some claim Darin began recording a Nat “King” Cole tribute album, and others believe that Motown recordings exist of some of the material he recorded for his NBC television special. In an interview shortly after Darin’s death, Bob Crewe, tasked with assembling Darin 1936-1973, alluded to this unreleased material but stressed that he only released “what Bobby would have wanted to be heard,” describing his friend as a “complete perfectionist.” Crewe was keenly aware of the Bobby Darin legacy, and felt it was important to include both “If I Were a Carpenter” and “Mack the Knife” as the final tracks on what he presumed would be Darin’s final album. We have maintained Crewe’s wish that these songs wrap up Darin’s career, and so they end our Motown Years, too. While not radically different as far as alternate versions go, five additional bonus tracks are appended for completeness’ sake. These are the single mix of “Something in Her Love” plus the alternate single mixes of “Simple Song of Freedom” b/w “I’ll Be Your Baby Tonight” and the CD mixes of two tracks from Darin 1936-1973. If further outtakes were to surface or Live at the Desert Inn to revert to Motown, a second disc (no pun intended) could easily be added to make a truly complete Darin at Motown collection. This is a marvelous theory that ought to become reality. “Another Song on My Mind: The Motown Years”. It is scheduled for release on March 11, 2016.